In the non-liturgical church of my childhood there was no such thing as Holy Week. Palm Sunday celebrated Christ’s triumphant entry into Jerusalem. The next time we gathered was Easter, another time of joyful celebration. There was nothing in between these two Sundays. How does this happen? In a liturgical setting Palm Sunday begins with the waving of palms and singing “All glory, laud and honor,” but midway in the service there is a dramatic change with the reading of the events that unfold in the coming days… the betrayal, the arrest, and the crucifixion. Palm Sunday then becomes the beginning of Holy Week when Christendom starts on a journey to the cross and the resurrection of our Lord. 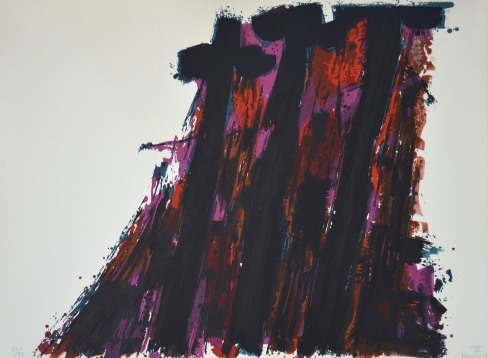 Alfred Manessier, a French non-figurative artist from the mid-twentieth century has created a series of fifteen lithographs called Suite de Pâques that powerfully capture the journey to Easter. Manessier’s series is not the traditional Stations of the Cross but is about the Light of Easter… the light that comes through the darkness. John 1 says that ‘the light shines in the darkness and the darkness does not overcome the light.’ This is the key to unveil the profound meaning of these lithographs. In 1943 Manessier experienced a religious awakening during a three-day visit to a Trappist monastery. Soon after he converted to Catholicism and had a fertile period of abstract painting with luminous colors. Suite de Pâques begins with The Garden of Gethsemane which vibrates with visual tension as heavy black slashes cover the underlying vibrant colours: the struggle has begun. As we move through the series with the Arrest and The imprisonment, more surface black tries to obliterate the light beneath. In The Cohort black forms a cluster suggesting the enraged mob that gathered asking for Jesus to be crucified. One of the most recognized of the series is The Crucifixion where three crosses stand seeming to reach upward toward the heavens (see at the top of the meditation). The darkest of all the lithographs is The Guard at the Tomb, nearly totally black, seemingly with no hope. But vibrant reds and oranges seep through the slightest cracks anticipating what is to come. Then comes the Empty Tomb where the sun shines and bright colors dominate a new day where the Light has overcome the darkness. In the last two images, The Angel’s Message and Mary Magdalene Sees Jesus, there is a joyous riot of color. The Angel announces the Resurrection, Mary sees Jesus, and all creation celebrates. During the coming week it is my hope that these fifteen Manessier lithographs can be the visual focus of your Holy Week meditations and a source of Light: the Light of Easter. To view the fifteen lithographs of the Suite de Pâques go to http://www.bowdencollections.com/manessier.html. 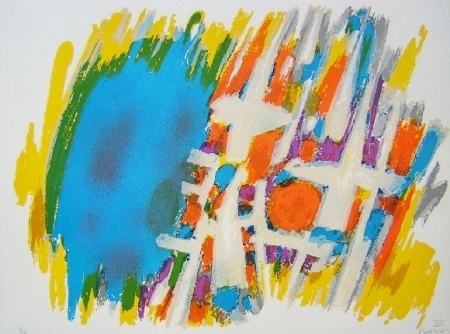 Alfred Manessier: Composer in Colors, a traveling exhibition organized by Bowden Collections, includes the Suite de Pâques and several other lithographs: Laudes with its meditative blues and light tones suggests quiet contemplation; La Nuit (Night) and A l’obscure (In the dark) alludes to the depths of the soul and the mysterious realms; Early Spring lightens the tone and rings of hope eternal. The original lithographic poster, Crown of Thorns, recalls the many times he used this images for his paintings. 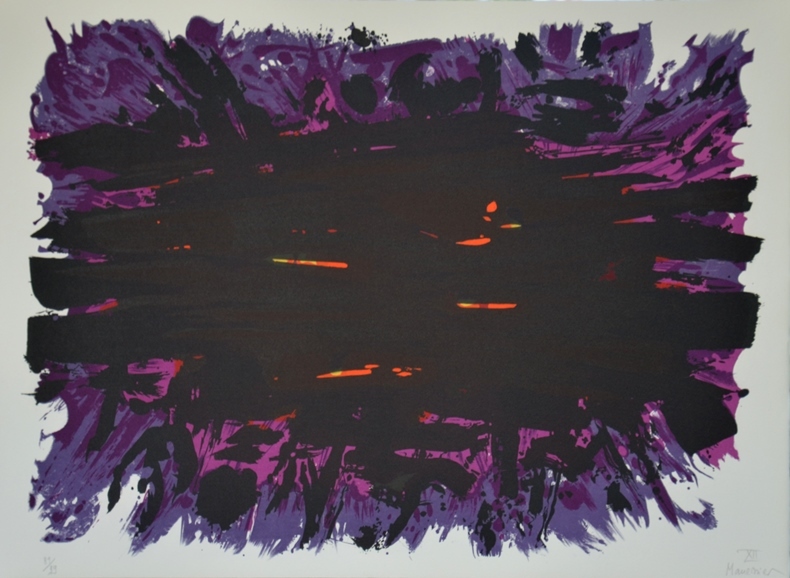 It is hoped that this show will introduce Alfred Manessier as an important artist of faith whose art rings forth a witness. Manessier’s art stands as a model of hope in a world searching for meaning. For more information go to www.bowdencollections.com. Sandra Bowden is a painter and printmaker living in Chatham, MA. In 2005 Square Halo published The Art of Sandra Bowden. With over 100 one person shows, her work is in many collections including the Vatican Museum of Contemporary Religious Art, the Museum of Biblical Art, and the Haifa Museum. She is also a passionate collector of religious art dating from the early 15th century to the present. Sandra was president of Christians in the Visual Arts from 1993-2007 and has curated many exhibitions and coordinated the CIVA exhibitions program since its inception. She studied at Massachusetts College of Art and received her BA from the State University of New York. For more information go to www.sandrabowden.com.